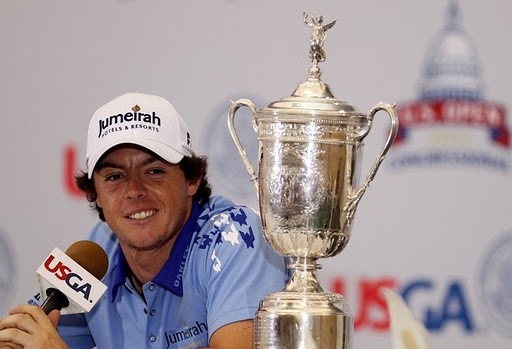 Rory McIlroy and his U.S. Open trophy at a press conference after his win. The great Philip Reid of The Irish Times is in Washington right now and already counting the votes in the Golfer of the Year awards for 2011 -- well, one vote to be precise. Philip, the highly respected golf correspondent with Ireland’s renowned paper of record, also serves his game as secretary of that fine body of men and women otherwise known as the Irish Golf Writers Association (IGWA). Every December or so, Philip sends out an email to the members of the IGWA asking for their votes in various categories for the association’s annual awards, including professional and amateur player of the year. I cast my vote last Sunday. In the afternoon to be precise. Before Rory McIlroy had even hit a fourth round shot at the U.S. Open. I was fairly certain that Rory -- a past winner of the IGWA award for the professional and amateur game as it happens -- was going to win the first major of his career, but I wasn’t sure. And it didn’t matter. Regardless of what happened late Sunday afternoon your time, very late Sunday evening here in deepest Meath, I had already decided that Rory’s opening three rounds at Congressional were worthy of the award. And even if Padraig Harrington or Graeme McDowell or Darren Clarke or Shane Lowry or my fellow Headfort member Damien McGrane win the British Open and the U.S. PGA titles or both between now and the end of the summer, I am not going to change my vote. I wouldn’t have changed it even if Rory had collapsed on Sunday as he did at Augusta some 70 days previously, and here’s why. What McIlroy did in the first three rounds of the 2011 U.S. Open proved he is up there as one of the greatest golfers the wonderful game has ever produced. What happened on Sunday merely gave him a major title to go with the claim to fame. To come back from his Masters disappointment by breaking records galore in the first three rounds of his next major was just incredible. To see the job through on Sunday was sensational. And we didn’t just witness the birth of a new golfing dynasty on Sunday. We also witnessed the end of another one. It makes no difference what Tiger Woods does next now. He can win another few majors, he can surpass the Jack Nicklaus record of 18 majors, he can become celibate and turn his back on women for all I care, but he is no longer invincible. Congressional, without the injured Woods, proved that, and maybe his absence did McIlroy a favor. Without Woods the latest edition of the U.S. Open needed to find a new hero, and boy did one jump out of the cabinet reserved for those with major potential. In winning this title, in breaking all those records, McIlroy proved that his Augusta Sunday was indeed a fluke. The real Rory McIlroy was there for all to see from start to finish in Congressional last week, and he will be around for a long time to come. As Padraig Harrington suggests, McIlroy can rule the world for many years to come now. He’s that good. He’s certainly going to rule the professional category at the Irish Golf Writers Awards dinner next January. And remember who voted for him first!